I bought an eDrometer early on and have used it extensively, along with my Tilt and Hanna digital refractometer. When I went to use it today, it appeared to be leaking . Closer inspection showed the silicone tubing was cracking near the entrance to the device. Their Facebook Page also shows little or no activity. Looking around some more, I noticed that Mile High Distilling still has a few in stock, so if I really wanted another one, I still might be able to get one. Since the one year warranty had long ago passed, I figured I'd have little to lose by tearing into it to see if it could be fixed. After some gentle poking and prying, I found that the top plastic cover could be removed as it was only secured with some food-grade silicone sealant. I'm ordering new tubing from McMaster-Carr, and will replace it all when it gets here. Since I'm more interested in function over form, I probably won't put the cap back on as long as it works. Good you can salvage it ..... but .... only use it for testing your wash . Too much synthetics in that for alcohol use. The silicone tubing was original and subjected to a fair amount of flexing over the years, so I'm very sure that it was a mechanical failure rather than a chemical failure. I've only recently used it for testing the ABV or SG of anything other than beer. 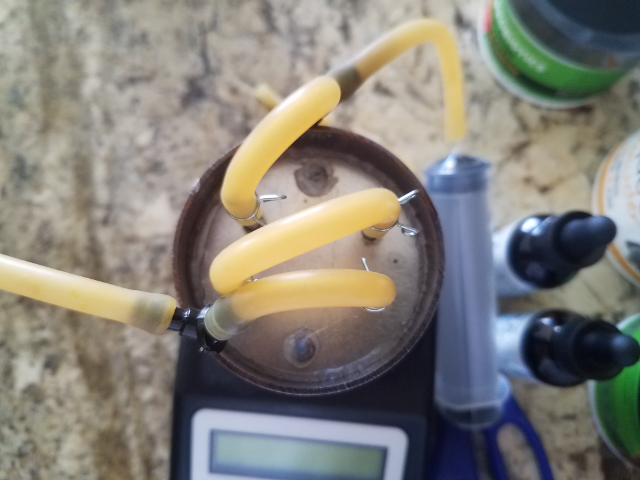 The tubing is yellow because I also used it to check the OG and FG of many beers, from light pale ales to very dark stouts, that I've made over the years. Also, since it only uses about 30ml (about an ounce) of liquid for the test, I always discard the sample, so the risk of contamination is nil. The tubing that I've ordered is flexible PTFE. I am new to this hobby, but not to all-grain brewing in general. Thanks for the advice though. Excellent replacing it with teflon . My bad , I wrongly assumed you would use it inline like a parrot . I also have an Edrometer though have not used it extensively as you have. Personally I would go back to food grade silicone tubing. I am of the belief that the PTFE will crack sooner than later with respect to continual movement and flexing. On a side note, how have you found the accuracy / reliability of the unit. At one time I compared results with the big Anton Par unit and the comparative results were encouraging. From what I can tell, the main body appears to be a stainless steel container housing the vibrating element. richard1 wrote: Personally I would go back to food grade silicone tubing. I am of the belief that the PTFE will crack sooner than later with respect to continual movement and flexing. I also ordered a length of platinum-cured silicone tubing. When the two items arrive I'll examine the relative flexibility of both and make a decision as to which I'll use. richard1 wrote: On a side note, how have you found the accuracy / reliability of the unit. At one time I compared results with the big Anton Par unit and the comparative results were encouraging. I also have a couple of Tilt hydrometers that I use to monitor my fermentations, as well as a Hanna digital refractometer, an alcohol refractometer, and several glass hydrometers. They all seem to track within a point or two of each other. I especially like the eDrometer and Hanna, as they have ATC. The Tilt is probably the least reliable in terms of accuracy, as the fermentation process can affect the reading if yeast or CO2 bubbles cling to it, but it's excellent at tracking the overall trend of the fermentation and determining when the fermentation is completed. I take a reading from the Tilt every 5 minutes, and post it to a google spreadsheet that generates a graph of SG and Temp. I received the tubings today and as you surmised, the "flexible" PTFE tubing really isn't, so I'll be using the silicone instead.